We believe that leadership and discipleship are woven closely together. LeaderTreks youth ministry thinks a mission trip is a great place to grow spiritual disciplines that lead to deeper discipleship. Each day on our trips we set aside time for spiritual growth. Each morning, we give students 45 minutes for devotions and every evening we gather as a team to discuss how we saw God working in our lives. 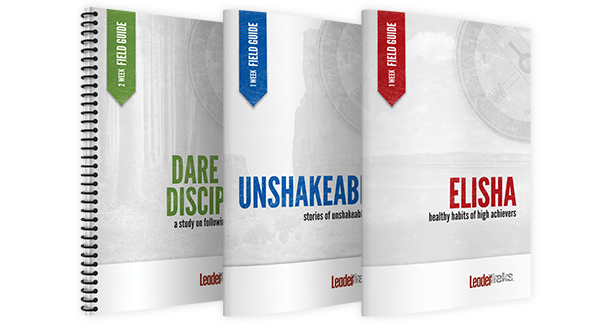 LeaderTreks Youth Ministry provides a trip book for each student, designed to develop spiritual disciplines and personal growth. The trip book has three main sections: the daily devotional, a prayer journal and a daily growth journal. Each Bible study is created around a book or Biblical characters found in Scripture. We use several different Bible study methods to teach these passages. Our goal is two-fold: to teach scripture and to teach study methods students can use when they get home. We don’t just tell students to have a quiet time; we give them the skills to do it. The daily prayer journal is designed to challenge students to use a prayer method such as ‘ACTS.’ Often students tell us that they don’t know how to pray and that they are not sure if God is answering their prayers. The goal of the prayer journal is to get students to understand that prayer is not about changing God’s mind but about changing their actions. By teaching students a pattern of prayer we are able to educate them on the power of prayer. If you don’t have a standard of measurement, how do you know if you are growing? The growth journal is a place to measure your progress every day and keep track of the day’s events. Parents tell us that they love to read the journal when students get home because they can see where growth took place in their students’ lives. Every evening on a LeaderTreks Youth Ministry trip is an adventure into God’s Word. At LeaderTreks Youth Ministry, we believe students learn best through student driven learning. On our trips, you won’t find a speaker making an emotional appeal, but instead you will find students studying together while your trip leader facilitates the discussion and keeps students focused on God’s Word. We sit in a circle and learn from each other through the sharing of insights. This type of learning leads to growth. Too many mission trips end in an emotional high that last only a few weeks. LeaderTreks Youth Ministry trips have a 52-week effect on your youth group because of the authentic spiritual growth that takes place.